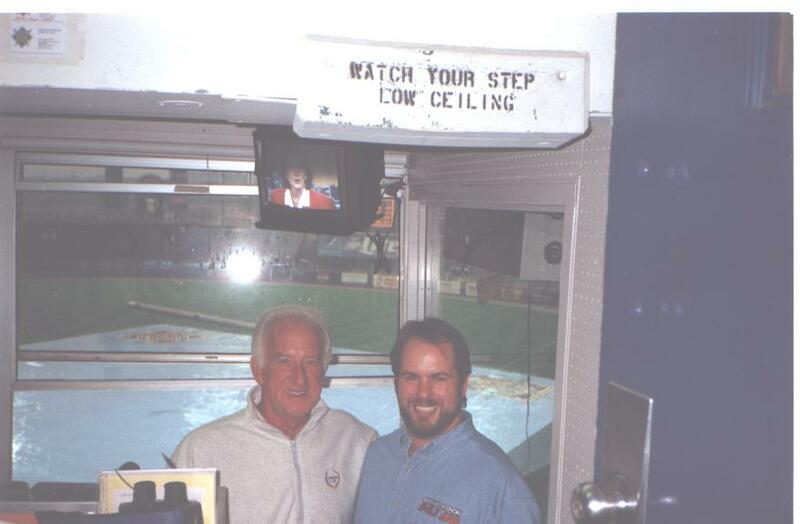 I never set out to meet Bob Uecker. It wasn’t anything I pursued. To me, Uke was the voice of the Brewers. An actor. A writer. A comedian. He was THE MAN. The guy I wanted to be when I attended broadcasting school. It was an impossible dream. I wouldn’t get to walk in Uke’s shoes, but one day I’d get lucky enough to stand next to him – without a lot of effort on my part. I got a call from my friend Adam in the summer of 1997. He asked if I’d be interested in attending a Brewers game with him and another friend on Saturday, August 30. You bet! I’m always up for a game unless I have a conflict. Oh, and as an added bonus…he arranged to get us a behind-the-scenes stadium tour with the possibility of meeting Bob Uecker. The cost? Free. Adam worked at a radio station within the Brewers radio network and the tickets and other perks were part of being in the network. Adam and I met in 1991 at a different radio station also in the Brewers radio network. It was neat because our air shifts sometimes fell during games. We got to “board op” the games – meaning we played local commercials at specific times and legal radio station identifiers (legal ID’s) when Uke or his then-partner Pat Hughes called for them. On more than one occasion I worked a Saturday evening and ran a game that didn’t end by midnight due to extra innings or a rain delay. Adam came in to do his overnight shift and concluded the game in the wee hours of the morning. So, we essentially paid our dues in radio while getting paid. The bonus was listening to hours of Bob Uecker and his one-of-a-kind humor and style. It was all about to pay off big time. We arrived at Milwaukee County Stadium a couple hours early as instructed. A stadium staff member met us at a media entrance I had passed by countless times on previous visits. We were taken to our seats on the lower first base side and got to watch the Brewers batting practice session first. It gave us a unique opportunity to get some good photos and watch Jim Powell record interviews for the pre-game show. Unfortunately, the Brewers were still wearing my favorite (eyes rolling) uniforms/logos of all-time. We were then taken on a short tour that ended at the broadcast and media booths. The staff member said they would check if we could go in and meet Uke, but it was getting close to the pre-game broadcast. They peeked inside and got the “all clear sign” from Brewers radio producer Kent Summerfeld. We quietly slipped into the booth just inside the door and squeezed together. I snapped a photo of Uke in his natural habitat, figuring that was the only opportunity to capture the moment. I was shaken back to reality when Summerfeld blurted, “Would you guys like to get a photo with Uke?” Geez, we didn’t even think it was an option! Of course! We took turns handing off the camera and standing next to Uke, grinning like Cheshire cats. I admit I got so excited that I nearly tripped and fell down the stairs to meet him. I somehow managed to keep my composure while I was in the booth, but I inside I felt like I was going to burst with excitement. Uke signed a piece of paper for me. Like an idiot, I didn’t consider an autograph as a possibility either and didn’t bring anything special with me. But that was ok. I had just met my baseball announcing idol. We were led out of the booth and taken back to the seating area. It was a pretty quiet walk considering what had just happened. I think we were still in disbelief that we met Bob Uecker – and we still had a game to watch. It was extremely chilly for late August and we all wisely wore long sleeved shirts. Living in Wisconsin made us accustomed to dressing in layers for outdoor events. The ballpark was covered in an eerie layer of fog and a chilly mist had been coming down since batting practice. Groundskeepers covered the infield with a tarp until the mist let up right around game time. A ten mile an hour wind blew in from right field toward – you guessed it – our seats on the lower level of the first base side. We didn’t let the lousy conditions deter us from enjoying seeing the Brewers hold batting practice before the game. 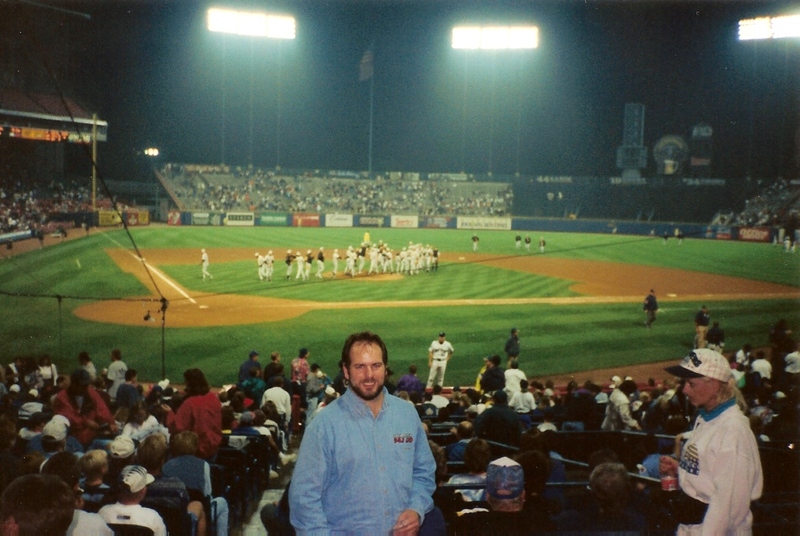 Yes – there was a game that night! Milwaukee was hosting Pittsburgh in the second game of a weekend series. The Brewers wouldn’t move to the National League until the following year, so this was an interleague matchup. Interleague play started that summer, and this was my first time seeing such a game in person. Former Brewers star and future coach Dale Sveum played first base for Pittsburgh. He would play just two more seasons and see limited action, first with the New York Yankees before coming back to Pittsburgh. Future Brewers catcher Jason Kendall was in the lineup as well for the Pirates. The ageless wonder Julio Franco was designated hitter for the Brewers that night. It was his lone season in Milwaukee. At age 38 it appeared his career was over, but he’d return to the big leagues in 2001 and play until 2007 when he was 48 years old. 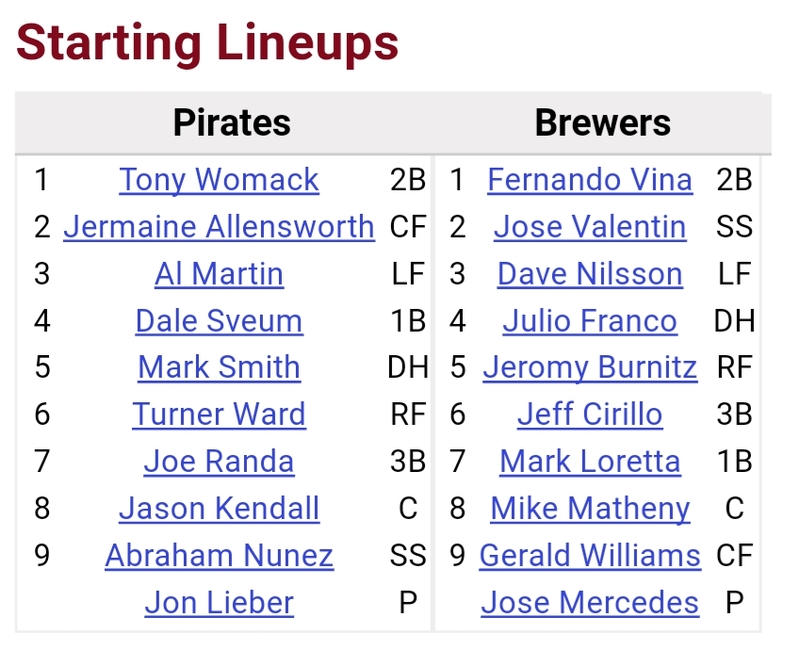 Jose Mercedes started for the Crew in what turned out to be possibly his best big league season. He threw his only big league shut out that season. Perhaps Baltimore Orioles fans remember him as the guy who nearly lost 20 games in 2001. He didn’t get a decision in his last two starts and the season thankfully ended with Mercedes stuck at 17 losses. Current St. Louis manager Mike Matheny was the other half of the Brewers battery that night. Designated hitter Mark Smith led off the second with a single and scored on a double by right fielder Turner Ward. Ward moved to third on a sacrifice bunt, but was picked off by Mercedes. Good thing too, as Jason Kendall singled right after that. Milwaukee tied the game in the bottom half of the second inning when Jeff Cirillo doubled and Mike Matheny followed with a single to bring Cirillo home. Pirates starter Jon Lieber kept Milwaukee in check and only allowed five hits in seven innings of work. The Crew only had one other legitimate chance to score in the bottom of the eighth off reliever Ricardo Rincon. With two outs, Dave Nilsson doubled and Julio Franco was intentionally walked. But Rincon got Jeromy Burnitz to ground out and end the threat. Smith and Ward again were the Pittsburgh scoring tandem in the fourth inning. Smith again led off with a single and Ward doubled him home. Pittsburgh took a 2-1 lead. Mercedes did manage to go eight innings and kept the Pirates in check other than those early mistakes. Still, manager Phil Garner wasn’t pleased with his performance, especially when it came to Turner Ward beating his former team. Smith gave the Pirates a little cushion in the ninth inning with a solo homer off Brewers closer Mike Fetters. The Brewers went 1-2-3 in the bottom of the ninth, giving Pittsburgh a 3-1 victory. Rookie Pirates reliever Rich Loiselle notched his 24th save. With the win, the Pirates improved to 68-68. Milwaukee fell to 67-67 with the loss. Time of the game was a brisk 2 hours and 22 minutes. A total of 23,673 were in attendance that night. The Brewers didn’t provide any fireworks during the game, so the least they could do was offer a brief fireworks show after the game. We hung around for that, and then headed back to Madison. We found out on the radio on the way home that Diana, Princess of Wales died in a car crash in Paris. It happened on Sunday in Paris but on our side of the world it was Saturday night when we were at the game. Of course, we were stunned, and could only get our news from the radio in those pre-smart phone days. We wrapped our night up back in Madison with a couple hours of pool. Playing with bent sticks (that are pretty much common in every bar) made for an interesting conversation topic, but most of our talk centered around the events of the day. We simply couldn’t stop talking about how meeting Bob Uecker couldn’t have been real. Nor could the tragic news from Paris be real. After our good-nights, we resumed our lives with that one day etched in time. Baseball, of course, moved on as well. Despite flirting with .500 records when the two teams met that weekend, neither ended the season at that mark or above. Milwaukee came in third in the AL Central division with a 78-83 record, eight games behind the Cleveland Indians. Pittsburgh finished up at 79-83, good enough for second place in the NL Central, five games behind Houston. Neither the game nor the season were particularly memorable as far as I’m concerned. But the friendship and night with Adam and Bob remains a wonderful memory. I wouldn’t change a thing from that time we met Bob Uecker.